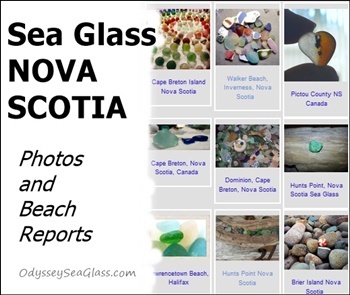 ~ sea glass report submitted by Melanie Smith in Moncton N.B. Sea glass has become a favorite past time of mine over the last few years. I collect it whenever I can and go all over the place to find it. When I visited Brier Island, Nova Scotia, I never expected to find such great sea glass and in such large amounts. If you have the time, you can find great sea glass here, large and small pieces which are great for jewelry. The best places to look on the Island are in and around the old docks when the tide is out, go under the docks and start your search. 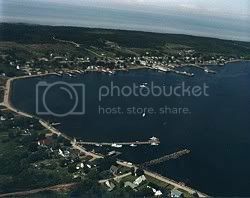 You can also find sea glass over by Peters Island light, drive to the end of the Island and park your car so you are looking at Peters Island light. To find the sea glass you will need to go over the bank to the left of your car and go along the shore. Sea glass is everywhere on the island and different colors are available. I find searching for sea glass to be relaxing but fun at the same time, and I hope all you sea glass fanatics will have as much fun as I do searching for sea glass. If you stay on Brier Island, a good place to stay is at the Brier Island lodge. They have a restaurant on site and farm animals around the ground and trails to explore. There is also a great view of the ocean from the lodge grounds. You can even get water view rooms which are great. The rooms at the lodge are not luxury so don't expect a fancy hotel but they are clean and reasonably priced and very comfortable. Have fun on your expeditions. Brier Island is frequently inundated by fog and has witnessed 57 recorded shipwrecks (Wikipedia)! Also, summer water temperatures are some of the warmest north of Virginia, USA. Where to stay? Find out why travelers rated A La Maison D'amitie B&B a superb 9.4 while vacationing near Brier Island. If you are looking for a fun attraction outside of your sea glass hunting on Briar Island, find the Briar Island Whale and Sea Bird Cruises and go on a whale tour. They are one of the best in the area and well worth the money you pay. The rates are good to for a whale tour and they make sure you see something. Thanks for visiting our island.Please return and enjoy,but please do leave some sea glass for the children to find. Too many folks are carting away all they can find/hold. Sea glass was plentiful when everything came in glass bottles and garbage was strewn on the shore - 1960's and before. Locals are finding themselves having to buy glass to smash ( for tourists and for local children )and it needs at least two or three winters before it is smooth. We value all children and hope each one is able to take home a few 'pretties'. Their joy upon finding something 'special' far outweighs hoarding by adults and/or all the jewelry money can buy. A lot of people now are taking their glass to smash to secrets spots on the island which shouldn't be. But, everyone takes SO much and don't leave any for children to pick up or anything so having a secret spot is a good idea for locals. Joshua Slocum's father's boot shop has now been transformed into a gift shop for local artisans. It's called Slocum's Boot Shop/ Hooking by the Sea Gift Shop. The name of the boat that Joshua Slocum sailed around the world on was called the Spray. One of the spare ferries for the islands (Long & Brier Island) is also named the Spray! The days after sea glass are gone.the beaches on water street are privately owned and no one should be trespassing. Please respect posted signs and keep of these beaches. Brier Island along the waterfront in the past had lots of seaglass until people started harvesting for commercial purposes. At one time you could get large multi colored pieces but this has now gone. now you only find small pea size in white, green and brown. Gone are the days when your children, grandchildren could go on the beach and get a handful of seaglass and be happy. Now people come with their lunch paid and buckets hoping to find a buckful of seaglass, sorry those days are gone. Leave what left for pleasure not business. You posted this great report awhile back and I'm just looking at it again. Do you have any photos of the sea glass or the beaches there?